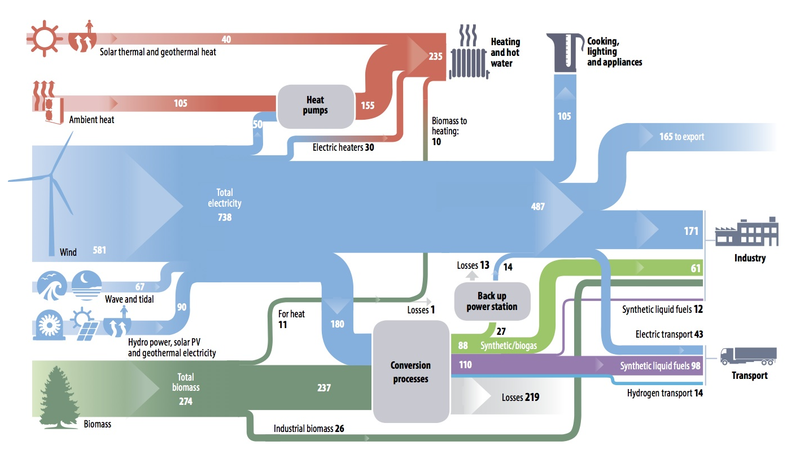 They have presented a Sankey diagram for the energy landscape in the UK, the way it could look like if Britain’s energy production was actually carbon free and 100% renewable energy. Flows are in TWh/year. The largest energy sources are wind and biomass. Some of the electricity is used to produce synthetic gas, synthetic liquid fuels and hydrogen (used mainly in the transportation sector). In that scenario there is even an electricity surplus that can be exported. While I can not judge how realistic such a vision of the UK energy landscape is, I can at least say it is very different from the current situation (see here or here), and even from this UK 2050 energy scenario.